The IBM Tivoli Monitoring solution is the next generation of the IBM Tivoli family of products that help monitor and manage critical hardware and software in distributed environments. 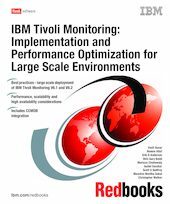 This IBM Redbooks publication provides a practical guide to implementing, using and optimizing IBM Tivoli Monitoring, including best practices for performance tuning, sizing, high availability, scalability, reporting, IBM Change and Configuration Management Database integration and firewall considerations. You will find a great deal of information about IBM Tivoli Universal Agents, including versioning, remote deployment and management, and meta servers. We also delve into details of IBM Tivoli Monitoring of the components, such as how these components interact, what is the underlying technology, details of configuration files, and where to check in case of problems. This book is a reference for IT professionals who implement and use the IBM Tivoli Monitoring solution in large scale environments.